My latte was Columbian, a new type of coffee-bean that the man behind the till sounded very excited about, but I didn’t notice a difference. I was more concerned with the warmth it could lend me to counter the dampness an hour and a half standing in the rain had bestowed on me. Wisely, we chose a seat near the window. Gazing out onto the crowd that had gathered on O’ Connell Street in protest of Pegida, a far-right anti-Islam group, we slurped our latte and white chocolate mocha admiring the rain. “We don’t condone racists,” a woman we had interviewed earlier had said as we gathered vox-pops from the crowd. She wore her purple scarf tied around her head, protecting her silver curls from the downpour. Kyle noticed it first, my head was turned to the sleepy American worker who forced his smile through gritted teeth as he collected empty Starbuck’s cups. Just as the clock was nearing three o’ clock a crowd of people nearing one hundred people ran across O’ Connell Street. Grabbing our things, we dashed through the door, Kyle leaving his mocha behind, a tiny trauma he never quite got recovered from. We followed the mob that rounded a corner and stampeded onto North Earl Street, not entirely sure who or what we were tailing. Rushing down the street towards Talbot Street, a man with a skin head and black bomber jacket ran towards us, his head was bleeding profusely. We pressed on, pushing past on-lookers until we got to the front of the crowd. 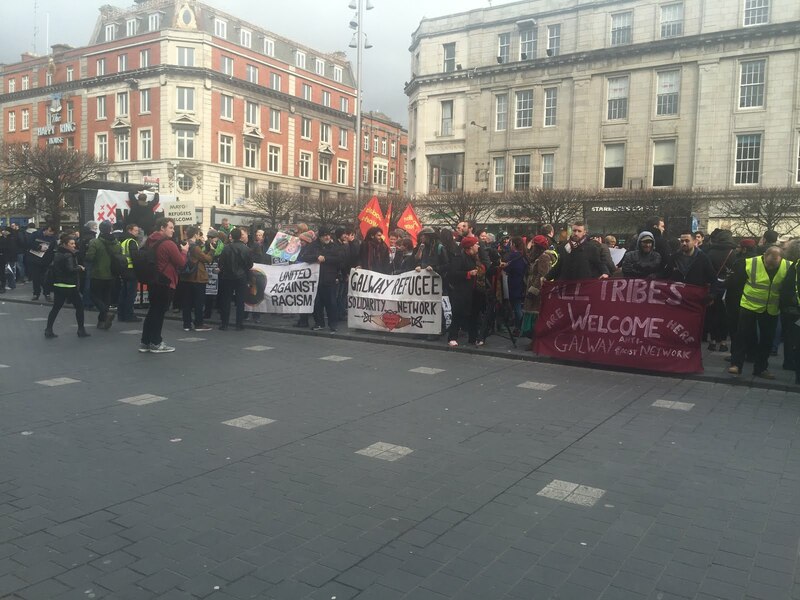 The gardai had gotten there first and blockaded one group from another. Was this Pegida that we were surrounded by, wearing masks and scarves over their head, I asked myself. They huddled together on the streets, up against the gardai who were now assisted by the garda public order unit in their navy stab vests and carrying batons. Next the dogs came. A large Alsatian bared its teeth and barked at the crowd, almost as intimidating as the people surrounding us. “Peter O’ Loughlin is making his way on the Luas now,” one man shouted making his way back up towards O’ Connell Street. The crowd scattered a little with the presence of the gardai. “What’s going on here?” Kyle asked a garda who looked three years his junior. “I know just about as much as you,” he replied, despite the fact we could hear a voice coming from the walkie talkie in the front pocket of his uniform. Slowly the gardai pushed us back up the road onto O’ Connell Street. We found ourselves standing outside the GPO once more. A lot of the counter-protesters were still gathered on the little island of concrete in front of the biggest post office in Ireland. 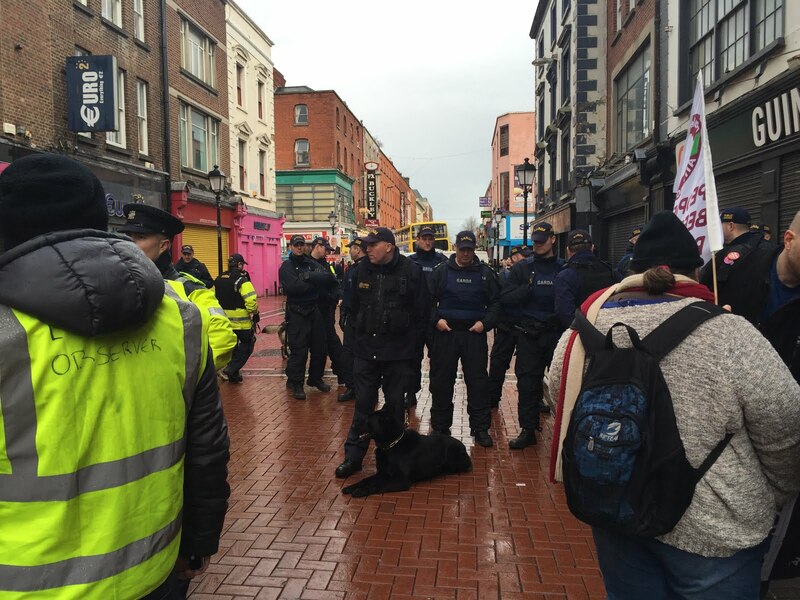 Posters reading “united against racism” and “Peter O’ Loughlin eats falafel” lined the sides of the now blocked off O’ Connell Street. Some people began to leave as a new crowd took its place. Teens and men in their early twenties, wearing uniforms of jeans with Adidas and New Balance trainers began to congregate. Giving each other friendly pats on the backs and man-hugs, they smiled and formed inwards circles revolving around each other and creating an atmosphere of tension in the street. More and more of them coming together until perhaps another 100 of them had gathered and began to launch across the street and run towards Parnell Street. At Burger King they rounded the corner and once more ran into a collision with the Public Order Unit. Kyle and I followed, along with dozens of other reporters who had now made their way in to cover the demonstration. The street was frantic with chants of ‘Nazi Scum off our street’, and the gardai were raising their batons, hitting those who were at the top of the group. A surge in the crowd down Cathedral Street and we were lunged forward only to be pushed back a few moments later. “The guards are going to come through the centre of the crowd in a second and let the protesters down the street,” one reporter gave us the warning. We ran into Beshoff’s fish and chip shop, perching ourselves at an upstairs table in order to get a good view of the action. We waited and waited, but no police broke through. Making our way back down the wooden staircase and onto the street once more we walked towards Abbey Street. “What’s happening now?” I asked an organiser who was wearing a yellow high-visibility jacket and a thick north-side accent. Later I would learn this was completely incorrect. That the left were on one side of the garda wall and the left on the other, both side believing that the other was Pegida. Peter O’ Loughlin of Identity Ireland and one of the founders of the Pegida Irish branch who was attacked on the Luas heading into O’ Connell Street that day would inform me that the AFA in Britain had sent over groups people to disrupt Pegida’s rally. He would say the following Monday that this was a rally to attract people to join Pegida Ireland, there were handfuls of them in the crowd scattered amongst the counter-protestors and there would never have been enough present for the right-wing party to clash against the left wing. Nevertheless, we followed the straddlers who were making their way towards Abbey Street. O’ Connell Street was now full of gardai and vans full of the public order unit had unloaded their men out onto the street. Gardai on horses walked along beside us as we came closer to the Luas lines. Bouts of shouting and confusion still lingered on the street, but the tension had fizzled out. A vague air of disappointment descended upon O’Connell street. It was time to return home and digest what had happened, for each side to place their spin and know their decided angle when their phones rang from the national press early Monday morning.